Lock in a great price for Nidos Seklyčia – rated 9 by recent guests! Perfect location, very spacious and clean room. The hotel has free parking for the guests. Great view. Charming, very pleasant room toward the lagoon. Food was beyond fabulous. Staff was wonderful. Fantastic experience!! Friendly and helpful staff (Thank you Dovilė) and outstanding location. amazing staff members, comfortable bed. loved spa procedures, location was amazing. really enjoyed staying here. What a fantastic little place that sites right in the heart of the city. Lovely and spacious room. Excellent service and a very nice restaurant for dinner or breakfast. We will stay here again when we return! Perfect condition of the hotel (old building but completely new from the inside) as well as perfect location (inside the park) and exceptionally friendly staff (helped us with everything). Great stay. Good location. Lovely hotel. Helpful staff. The staff, very friendly and helpful. The breakfast and the situation. 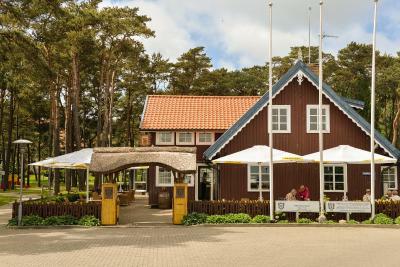 This is a small hotel on the brink of Nida, a small but extremely clean and quiet fisherman's village. The room was comfortable, the wifi connection was good and the staff was helpful and friendly. Just a couple of steps from the hotel you have the Curonian Lagoon and you can see the famous dunes. The Russian border is just a couple of kilometers away, therefore it is a good base if you would like to visit the Kaliningrad Region (visa is needed!). The hotel has a private parking, which is also an advantage. Overlooking the Curonian Lagoon, Nidos Seklyčia is located at the foot of the impressive Parnidis Dune. The center of Nida is 650 feet away. All rooms at Nidos Seklyčia offer satellite TV, a mini-bar, and a bathroom with bathrobes and a hairdryer. The spa area features a Turkish bath, an infrared sauna, and a large hot tub. It can be used at an additional cost. Nidos Seklyčia’s elegant restaurant serves Lithuanian and international cuisine, as well as a selection of fine wines. It operates from May till the end of September. Free private parking is available at Nidos Seklyčia. When would you like to stay at Nidos Seklyčia? Bedroom with a large four-poster bed, marble bathroom, separate living room, direct views of Parnidis Dune. There is no capacity for an extra bed in this room type. House Rules Nidos Seklyčia takes special requests – add in the next step! Nidos Seklyčia accepts these cards and reserves the right to temporarily hold an amount prior to arrival. loudly sound in a room from swimming pool and jakuzzi place, price is too expensive on a low season. have few troubles with wi-fi. Cozy rooms, great staff, quiet place. Nothing: everything was perfect! Yes, at low season there is no restaurant at the hotel but there is a nice caffee not so far (less than 5 minutes); but it was stated and expected. Love the location next to the green park. The staffs are friendly and the beds are comfortable. In arrival, it's hard to find where is the parking place and entrance. The room is too dark and there's no place to throw garbage Very noisy hall (right behind the room door). Slow internet connection for those who need to work with bigger files. Breakfasts, dinners, room, location, great vibe.